Profit margins are one of the first things anyone considered when looking for a good fundraiser. You want to keep as much money as possible to help your team participate in tournaments, buy uniforms, and cover other expenses. These ideas for sports team fundraising are some of the best high-profit options out there. National food franchises (mainly pizza franchises) offer discount cards. Your local franchise will determine what the card’s value will be. Sometimes, your donor will get a free medium pizza with the purchase of a large pizza. Other times, the deal only offers a dollar or two off of an order. On average, you’ll be able to keep 70% of profits from the discount card. Fundraising companies usually offer these cards with no upfront costs. All around, they’re a pretty good deal...it depends on your target audience how good a deal it might be for them. Scratch cards are known to have the highest profit margins among all fundraisers. The cost of raw materials is very low, since you’re only using paper cards and coupon sheets. However, you’re probably going to have to spend at least $10,000 upfront to qualify for the 90% margin. When they donate, they receive coupons to national business chains. The total value of the coupons adds up to around $100 for your donor, if they could use all the coupons. It's more likely that only 3% of the coupons will ever be redeemed. There are a plethora of popcorn fundraisers. Some of them don’t require an order form, and you can give donors their popcorn immediately. But those aren’t going to be at the 40% mark. The popcorn fundraisers that do require an order form are going to earn you around 40% profit. Each order will cost your donor $10. Popcorn fundraisers made it to the number two spot in our list because many of them require no upfront costs, offer high-quality products, and have a long history as being effective sports team fundraisers. #1: Premium Chocolate - 50% Profit Sports Team Fundraiser, in 2-3 Weeks! 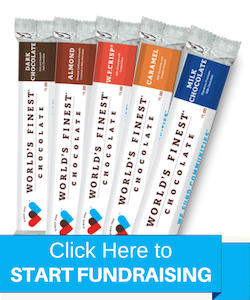 World’s Finest® Chocolate offers value and Made in the USA product quality that remains unmatched in the fundraising world. The balance between high quality chocolate, 50% profit margins, and simplicity makes it your top choice for a sports team fundraiser. Get started today with the ultimate sports team fundraiser. Grab a free fundraising guide, or get in touch with your local rep! We’re happy to answer questions to help you get started.